Item citation: From folder 3 of the William Ray Wells Papers #2960-z, Southern Historical Collection, The Wilson Library, University of North Carolina at Chapel Hill. I have fortunate in finding where our reg. was encamped. I met Capt. Church, Capt. Co. A. yesterday morning. I enquired of him and he told me where they were. I recd. 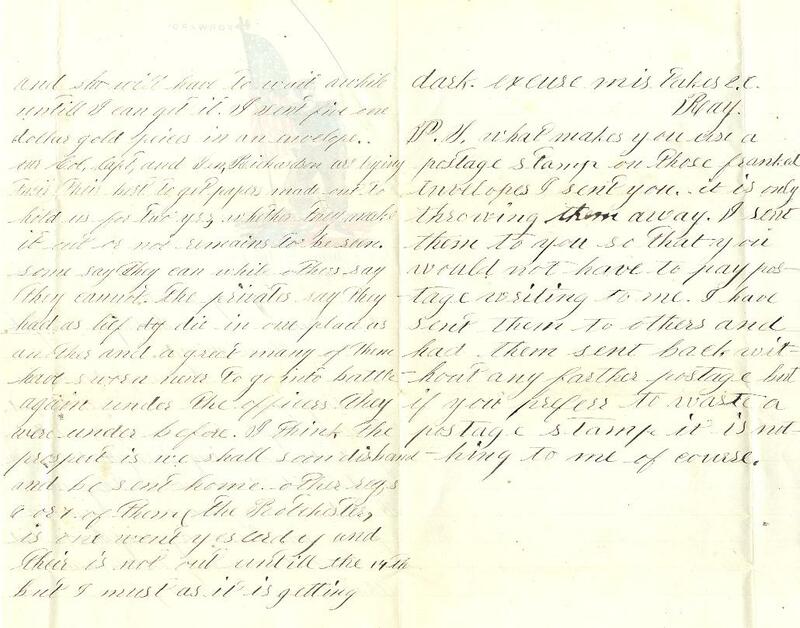 a letter from pa and another from ma. I am very sorry Alicia did not rec. the money for the reason that I have no more at present to send and she will have to wait awhile untill I can get it. I sent five one dollar gold pieces in an envelope. Our Col., Capt., and Gen. Richardson are trying their their best to get papers made out to hold us for two yrs. whether they make it out or not remains to be seen. Some say they can while others say they cannot. The privates say they had as [?] die in one place as another and a great many of them have sworn never to go into battle again under the officers they were under before. I think the prospect is we shall soon disband and be sent home. Other reg., 6 or 7 of them (the Rotchester, is one) went yesterday and their is not out untill the 14th. But I must as it is getting dark. Excuse mistakes, &c.
P.S. what makes you us a postage stamp on those franked envelopes I sent you. It is only throwing them away. I sent them to you so that you would not have to pay postage writing to me. I have sent them to others and had them sent back, without any farther postage. But if you prefer to waste a postage stamp it is nothing to me of course. 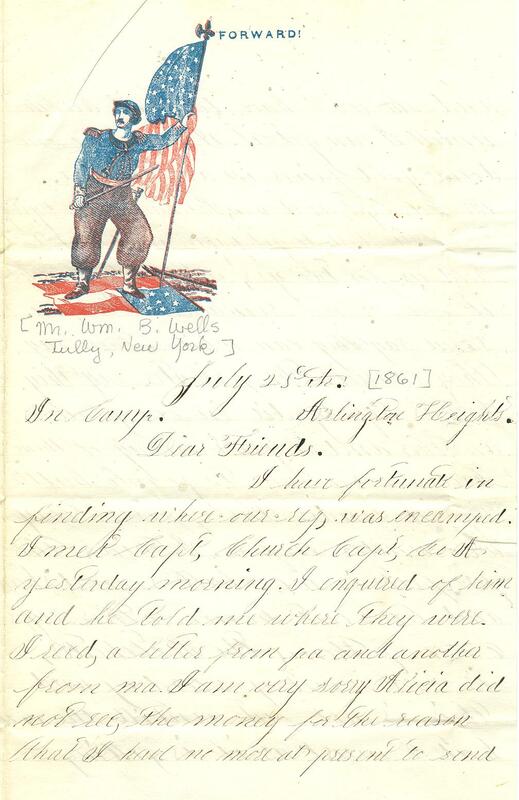 This entry was posted in Southern Historical Collection and tagged 12th New York Infantry Regiment, First Battle of Bull Run, First Battle of Manassas, Onondaga Regiment, postage, Washington (D.C.), William Ray Wells. Bookmark the permalink.